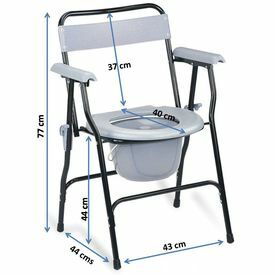 This Commode chair comes with a backrest and removable non-stain, odor resistent plastic pail. While not height adjustable, it can be easily folded and store away or carried on travel. The armrests provide a comfortable place to rest on when sitting and indicate a safe place to grab making sitting and standing easier. 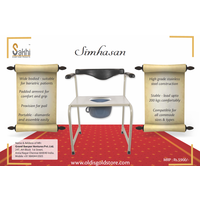 In addition to comfort this commode can be folded by hand making it convenient even while travelling. The construction of the chair ensures good strength and long lasting durability. 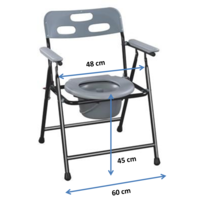 The frame is rust resistant and the foldable chair and toilet seat can even be used as a bedside commode. There is also a lot of room provided for arm space and then there is wide base depth for providing that extra stability. 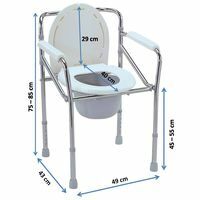 For people who need a commode close to the bed, this is an inexpensive and perfect option. 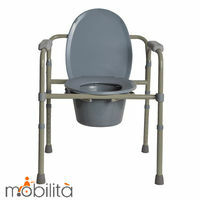 This Commode chair comes with a backrest and removable non-stain, odor resistent plastic pail. While not height adjustable, it can be easily folded and store away or carried on travel. 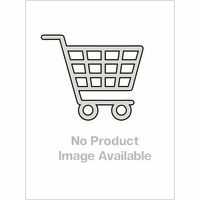 The armrests provide a comfortable place to rest on when sitting and indicate a safe place to grab making sitting and standing easier. 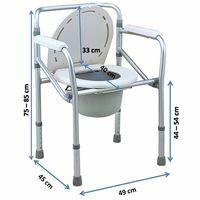 In addition to comfort this commode can be folded by hand making it convenient even while travelling. The construction of the chair ensures good strength and long lasting durability. The frame is rust resistant and the foldable chair and toilet seat can even be used as a bedside commode. There is also a lot of room provided for arm space and then there is wide base depth for providing that extra stability. 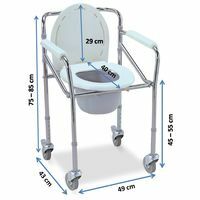 For people who need a commode close to the bed, this is an inexpensive and perfect option.